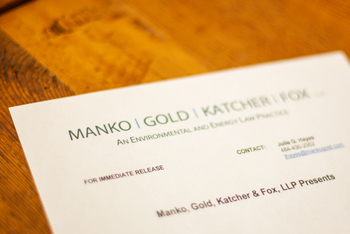 Philadelphia, PA (August 20, 2012) – In response to client needs, Manko, Gold, Katcher & Fox, LLP, (MGKF) the environmental, energy and land use law and litigation firm based in Bala Cynwyd, PA, has opened a satellite office in Williamsport, PA. The new office is located at 25 West Third Street, Suite 303 in Williamsport. It will be the third office for MGKF, adding to their Bala Cynwyd and Cherry Hill, New Jersey locations.